Koutnik AP, D'Agostino DP, Egan B. Anticatabolic Effects of Ketone Bodies in Skeletal Muscle. Trends Endocrinol Metab. 2019; pii: S1043-2760(19)30012-8. Ari C, Koutnik AP, DeBlasi J, Landon C, Rogers CQ, Vallas J, Bharwani S, Puchowicz M, Bederman I, Diamond DM, Kindy MS, Dead JB, D'Agostino DP. Delaying latency to hyperbaric oxygen-induce CNS oxygen toxicity seizures by combinations of exogenous ketone supplements. Physiol Rep. 2019;7(1):e13961. Ari C, Kovács Z, Murdun C, Koutnik AP, Goldhagen CR, Rogers C, Diamond D, D'Agostino DP. Nutritional ketosis delays the onset of isoflurane induced anesthesia. BMC Anesthesiology. 2018;18:85. Koutnik AP. Stair climbing exercise as a novel health intervention for menopause: cardiovascular and skeletal muscle implications. Menopause. 2018;25(7):721-722. Stubbs BJ, Koutnik AP, Poff AM, Ford KM, D’Agostino DP. Commentary: Ketone Diester Ingestion Impairs Time-Trial Performance in Professional Cyclists. Frontiers in Physiology. 2018;9:279. Poff A, Koutnik AP, Egan KM, Sahebjam S, D'Agostino D, Kumar NB. Targeting the Warburg effect for cancer treatment: Ketogenic diets for management of glioma. Semin Cancer Biol. 2017; S1044-579X. 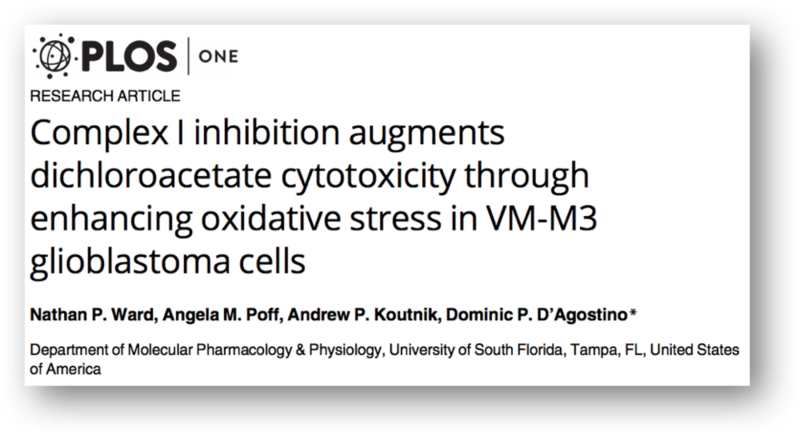 Ward NP, Poff AM, Koutnik AP, D'Agostino D. Complex I inhibition augments dichloroacetate cytotoxicity through enhancing oxidative stress in VM-M3 glioblastoma cells. PLoS One. 2017;12(6):e0180061. Dossat AM, Sanchez-Gonzalez MA, Koutnik AP, et al. Pathogenesis of depression- and anxiety-like behavior in an animal model of hypertrophic cardiomyopathy. The FASEB Journal. 2017;31(6):2492-2506. Ari C, Kovács Z, Juhasz G, Murdun C, Goldhagen CR, Koutnik AP, Poff AM, Kesl SL, D'Agostino DP. Corrigendum: Exogenous Ketone Supplements Reduce Anxiety-Related Behavior in Sprague-Dawley and Wistar Albino Glaxo/Rijswijk Rats. Frontiers in Molecular Neuroscience. 2017;10:36. Ari C, Kovács Z, Juhasz G, Murdun C, Goldhagen CR, Koutnik AP, Poff AM, Kesl SL, D'Agostino DP. Exogenous Ketone Supplements Reduce Anxiety-Related Behavior in Sprague-Dawley and Wistar Albino Glaxo/Rijswijk Rats. Frontiers in Molecular Neuroscience. 2016;9:137. Sanchez-Gonzalez MA, Guzik P, May RW, Koutnik AP, Hughes R, Muniz S, Kebbaj M, Fincham FD. Trait anxiety mimics age-related cardiovascular automin modulation in young adults. Journal of Human Hypertension. 2014;29:274. Sanchez-Gonzalez MA, May RW, Koutnik AP, Fincham FD. Impact of negative affectivity and trait forgiveness on aortic blood pressure and coronary circulation. Psychophysiology. 2015;52(2):296-303. Dweck D, Sanchez-Gonzalez MA, Chang AN, Dulce RA, Badger CD, Koutnik AP, Ruiz EL, Griffin B, Liang J, Kabbaj M, Fincham FD, Hare JM, Overton JM, Pinto JR. Long Term Ablation of Protein Kinase A (PKA)-mediated Cardiac Troponin I Phosphorylation Leads to Excitation-Contraction Uncoupling and Diastolic Dysfunction in a Knock-in Mouse Model of Hypertrophic Cardiomyopathy. The Journal of Biological Chemistry. 2014;289(33):23097-23111. Koutnik AP, Figueroa, A, Wong A, Ramirez KJ, Ormsbee MJ, Sanchez-Gonzalez MA. Impact of acute whole-body cold exposure with concurrent isometric handgrip exercise on aortic pressure waveform characteristics. Eur J Appl Physiol. 2014;114(9):1779-1787. Koutnik AP, Sanchez-Gonzalez MA, May RW, Hughes RM, Fincham FD. 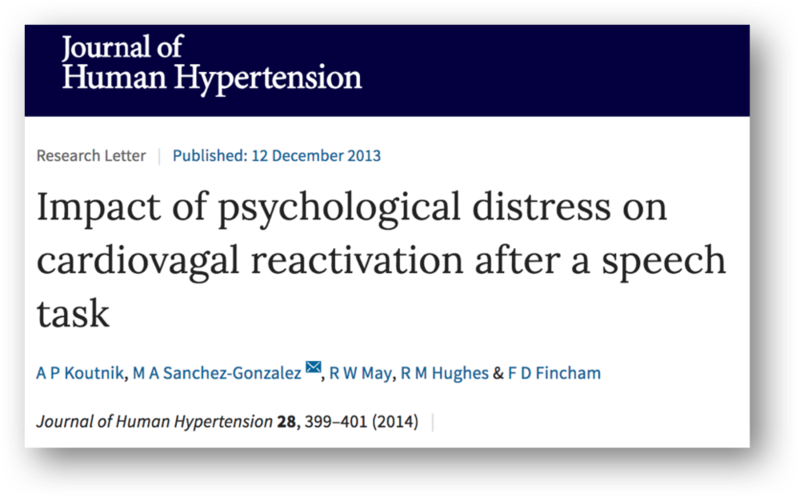 Impact of psychological distress on cardiovagal reactivation after a speech task. J Hum Hypertens. 2014;28(6):399-401. May RW, Sanchez-Gonzalez MA, Brown PC, Koutnik AP, Fincham FD. School burnout and cardiovascular functioning in young adult males: a hemodynamic perspective. Stress. 2014;17(1):79-87. Koutnik AP, Wong A, Kalfron R, Madzima TA, Figueroa A. Acute passive vibration reduces arterial stiffness and aortic wave reflection in stroke survivors. Eur J Appl Physiol. 2014;114(1):105-111. Sanchez-Gonzalez MA, May RW, Koutnik AP, Kabbaj M, Finchman FD. Sympathetic vasomotor tone is associated with depressive symptoms in young females: a potential link between depression and cardiovascular disease. Am J Hypertens. 2013;26(12):1389-1397. Sanchez-Gonzalez MA, Koutnik AP, Ramirez K, Wong A, Figueroa A. The effects of short term L-citrulline supplementation on wave reflection responses to cold exposure with concurrent isometric exercise. Am J Hypertens. 2013;26(4):518-526. Sanchez-Gonzalez MA, May RW, Brown PC, Koutnik AP, Finchman FD. 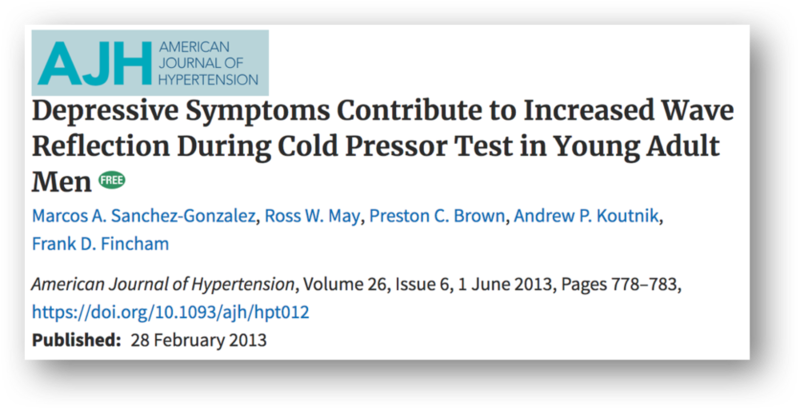 Depressive symptoms contribute to increased wave reflection during cold pressor test in young adult men. Am J Hypertens. 2013;26(6):778-783.